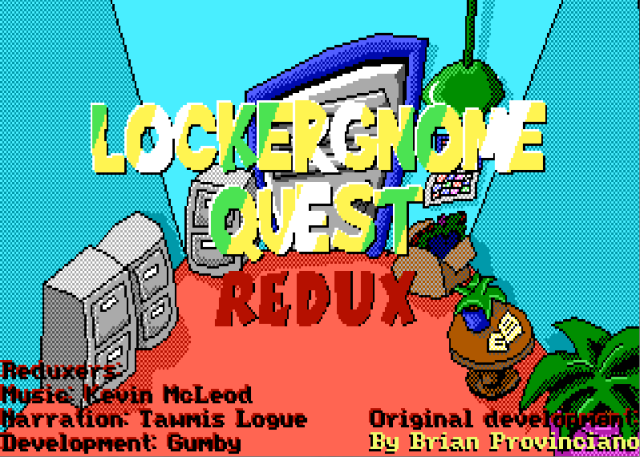 Game Description This is a modification of Brian Provinciano's original demo game 'LockerGnome Quest', which can be found and downloaded from the fan games pages. Primarily, this demo has been modified to support external sound playback (sound playback not utilizing the SCI sound drivers), showcasing the capabilities of the 'sciAudio' add-on, now available for SCI developers to use in their own games. - This demo has the distinction of being the first full SCI0 'talkie'! All lines have been narrated, enriching gameplay. - Full source code: See how sciAudio is 'wired' into the game! For installation & playing, please be sure to read the included readme.txt file. While the original was never bad, the addition of the mp3 playback as well as the narration are spectacular. Good work on this Gumby, it really is exciting to see something new that is actually that cool.